When the late veteran Tom Eagle spoke, people listened. Even Queen Elizabeth II. As the story goes, Eagle was preparing to travel to Europe in 2005 to attend memorial services in honor of Canadian soldiers who lost their lives overseas, but he noticed a glaring oversight in the itinerary. Suspecting the proceedings would fail to acknowledge the Aboriginal effort in the Second World War, Eagle snapped into action, informing Veteran's Affairs Canada of the omission. Close friend and former Assembly of First Nations national chief Phil Fontaine said such persuasive tenacity was Eagle’s trademark, and he worked long and hard to have Aboriginal veterans recognized, resulting in a number of developments. “He just never gave up when he took up a position on something. He took every opportunity to remind us about Aboriginal veterans. And when he pushed to have Native language become a part of the televised memorial services in 2008 in Ottawa, no one thought it was possible. But Tom’s idea and lobbying made it happen,” said Fontaine. “He was right up there with the rabbis and padres saying prayers in Ojibway. He carried himself so proudly. What he did was ground-breaking,” said Fontaine. Though Eagle was a member of the Tootinaowaziibeeng (Valley River) Ojibway First Nation in Manitoba, his adopted city of Yellowknife in the Northwest Territories felt his impact when he took up residence there in later life. He headed up the Tree of Peace Friendship Centre as executive director from 1979 to 1984, and then again from 1986 to 2002. After he became chair of the Northwest Territories/Yukon Friendship Centre Association, he helped establish centres in Fort Smith, Fort Simpson, Hay River, Fort Providence, Rankin Inlet and Behchoko. Before retiring from the Tree of Peace Friendship Centre in 2002, Eagle focused on bringing more attention to his fellow warriors in Yellowknife by spearheading a move to have 49th Ave. by City Hall named "Veterans Memorial Drive" and constructing a veteran's monument. Both Fontaine and Roy Erasmus, who oversaw Eagle's executive director position as a board member, commented on Eagle's booming voice and rigid discipline. “He could appear gruff at times, but you could tell all he ever wanted was to see his Aboriginal people be treated well and with respect. He had a military background and he was very organized,” Fontaine said. Of all his accomplishments, Eagle was especially proud of his military career. He joined the Canadian Army in 1951 at the age of 19. He was honorably discharged with the rank of sergeant after a 25-year career that included two tours of military duty in West Germany and service with the United Nations peacekeeping force in Cyprus. His awards and honors include the Canadian Forces Decoration, Queen’s Jubilee Medal, Citation from the Government of Canada for his contribution to community work and the Veteran's Affairs Commendation. 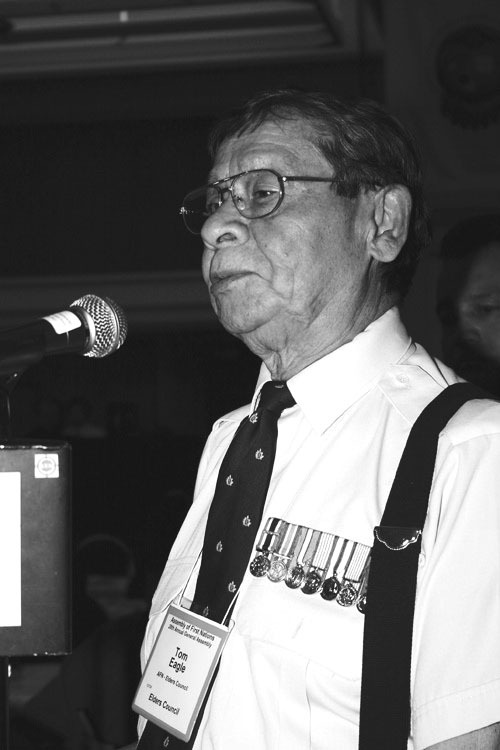 Before moving to Yellowknife as a sergeant with the Canadian Armed Forces, Eagle acted as Métis chief spokesperson with the Federal Housing Task Force from 1968 to 1969, and two years before that he was the chief organizer during the formation of the Manitoba Métis Federation. He was also involved in founding the fledgling National Indian Brotherhood, which would grow to become today’s Assembly of First Nations. He served as president of the National Association of Friendship Centres and completed a three-year term on the National Seniors Advisory Council of Canada. Muriel said her husband’s travels, work, volunteerism and activism resulted in a multitude of people who called him friend. After a short illness, he passed away on Sept. 29, 2009. He was 77.